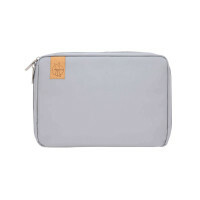 The Green Label Tyve Diaper Clutch Grey offers enough space for the main diaper change essentials. 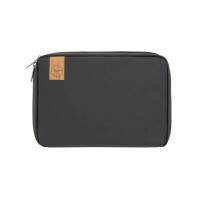 A changing mat, removable utensils bag and a shoulder strap are among the accessories. Compact, practical, sustainable. Product information "Tyve Diaper Clutch, Light grey"
description & equipment Compact, practical, sustainable. LÄSSIG’s Diaper Clutch is a multi-functional accessory that accompanies the modern family in daily life and offers ideal support when changing diapers away from home. The easy-to-use bag combines practical organization with a discrete, modern design. The diaper clutch is equipped with various compartments that provide space for diapers, wet wipes and tissues, a removable zipped bag for utensils and a water-repellent changing mat. An additional, removable strap allows enables it to be worn casually over your shoulder and makes it the perfect changing bag accessory. A zipped compartment on the reverse side complements the multi-functional clutch. This means you always have the necessities at hand for your little one. This practical clutch is designed to fit into any handbag or backpack. The innovative outer material Tyvek® from DuPont combines several compelling properties. It is extremely lightweight, tear-resistant and durable and looks great. Thanks to the Tyvek® material, sustainability of these bags doesn’t come up short because this material conserves resources and is easy to recycle. The additional external coating of the material gives the clutch water-repellent properties.